Last month I spent a week in Shanghai and I thought I’d explain how this all came about. In 2017 Vivian Wu approached the London Academy of Dramatic Art to see if she could undertake some training to equip her to run an educational company in China which resulted in her obtaining a Teacher’s Certificate in Communication. 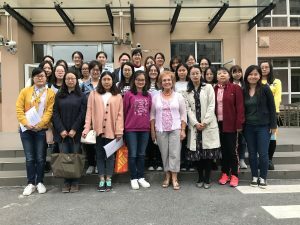 She had been working in the business sector in the UK for 12 years and was now going back to China where she hoped to offer educational services, including LAMDA exams. 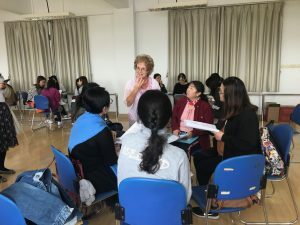 After her return to her home city of Shanghai she set about discovering what the local educational authority were interested in improving and that turned out to be the teaching of English. She contacted LAMDA again to ask if they had an examiner who could deliver a practical course for her and I was recommended. This was partly because I had spent a month examining in China in 2017 and also because I had worked in several schools as a peripatetic speech and drama teacher during my earlier working life. Emails and phone calls were exchanged and Vivian actually flew over and came to meet me for an afternoon to discuss the potential content of the course. Then it was time for me to write the material, which took a couple of weeks. We began with a 2 day format and this was submitted in competitive tender to the educational authority. We were successful and it then became apparent that there was enough material for a 3 day course and I rewrote accordingly. Day 1 focused on using poetry in performance to teach pronunciation, rhythm, rhyme and character. The final session of the day explored choral speaking with everyone involved in bringing “The King’s Breakfast” by A.A. Milne to life. Day 2 was drama based, using devising and play scripts to encourage the natural flow of English expression, imagination, team-work, storytelling and movement. I included mime and mask work too. Day 3 was instigated by the educational authority. They wanted to see the work in action so I taught 20 junior students (aged 10) using “Alice in Wonderland” by Lewis Carroll as the source material. So, October arrived. I flew to Shanghai and had a day to recover before the course began. There were 33 teachers with an almost equal mix of primary and secondary. Some had very fluent English and some were less confident but all were keen to improve the way they taught the subject. I understood that they only used a “Listen and Speak” workbook provided by the education department and had no direct access to English Literature in the classroom. This was a very practical course and as non-drama trained teachers they were often taken out of their comfort zone but they all gave it a go. Questions were frequent and I tried to answer them all. There was a lot of laughter and quite a few “light bulb” moments. When I worked with the primary students, many were astonished. 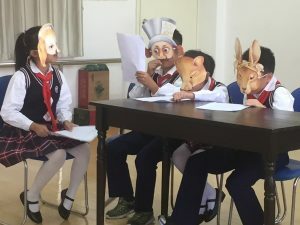 With the advice of the teacher, 5 children who had good English understanding worked with Vivian on “The Mad Hatter’s Tea Party”. I had adapted “The Pool of Tears”scene for the remaining 15 children in which they all played animals, both real and imaginary. Three strong speakers played Alice, Mouse and Lory who had several lines each and everyone else had one or two. These lines were highlighted on their scripts so after some simple explanation of the characters, where the scene was taking place and what movements they needed, we rehearsed a couple of times and then performed it. It was a pleasure to encourage the teachers to make their English classes more practical and enjoyable. Feedback has been extremely positive and I anticipate a return visit to Shanghai in 2019 to train more teachers.